Rocking Horses are a longstanding tradition in England and Great Britain and it is home to the world's leading traditional rocking horse makers of hand made classic wooden rocking horses, many of whom export around the world. Beautiful Victorian rocking horses, including the tradtional dapple grey and also polished wood finished, are hand carved by craftsmen for children and adults. The horses are tacked-up with the finest English leather tack and fitted with horsehair manes and tails. 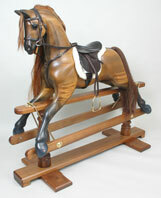 We provide UK antique rocking horse restoration and repairs for old family favourites. Every rocking horse restorer in our small group has many years of experience of rocking horse renovation and repair and our rocking horse repair and refurbishment service covers most of the UK. We make, we sell, we restore. Rocking horses only! "Europe's Favourite Rocking Horse", is probably the world's finest children's rocking horse and a splendid choice for any young child. 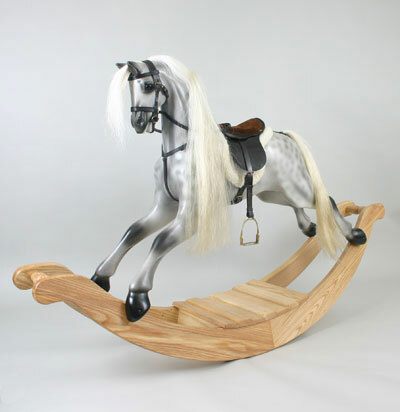 This beautiful wooden rocking horse is hand crafted from beech wood, and the finish shows the beautiful natural grain of the wood. This horse is exceptionally strong and stable and has won many awards for design and practicality. The optional leather saddle and bridle shown in the photo add lovely finishing touches. 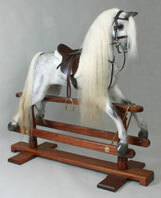 Search Google for "Kensington rocking horses" or contact us for more information. English rocking horse making dates back to the earliest Victorian times and there are Victorian rocking horses made in this spirit. The finest of seasoned timber is carved by experienced British professional rocking horse makers and made into exquisite rocking horses. 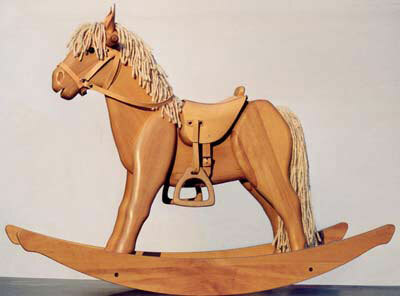 Edwardian rocking horses are made on bows and safety stands (gliders). 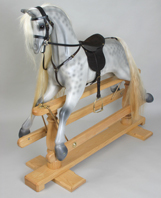 They can be made in the antique rocking horse style or a more contemporary finish. 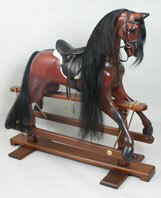 In the past, Georgian, Edwardian and Victorian bow rocking horses were made on deep and lively bows! Nowadays, the bows are designed to be exciting, but not scary. Please note that the stable is expanding all the time. If you can't find the horse you are seeking, please contact us to discuss your requirements. We do not offer Stevenson Brothers rocking horses, though we do have attractive alternatives to Stevenson Brother rocking horses which may cost significantly less, so please do contact us for full details of what we offer.